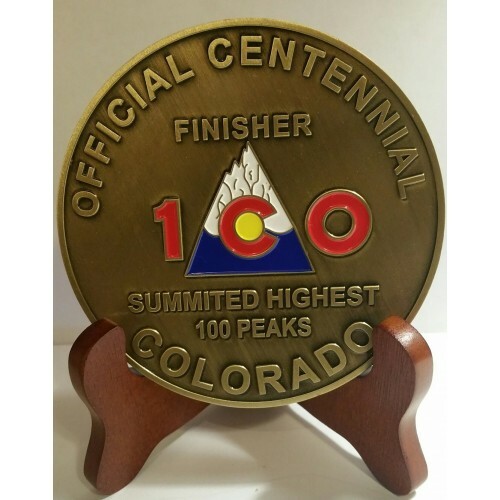 Now you can celebrate the amazing accomplishment of summiting all 100 of the tallest summits in Colorado. This is for the real summiteer in Colorado. Having summited the 100 tallest peaks in Colorado is no easy task. All of them are 13,500 feet above sea level or higher, and many can be very technical and dangerous. This marker can commemorate this great accomplishment, and be a trophy to anyone who has completed this amazing adventure. We can also custom engrave this marker with your message on the back. You can add the date, the last summit, what ever you want. .
Just add Custom Engraving to your order but clicking the box and it will ad to your order. Give us the details of what you would like engraved on the back of the marker. This is available as an option. Just add the text to the area in checkout. up to 100 characters. The only thing you will need to decide after, is what to do next????? **Marker has been antiqued to look like it has been at the top of the mountain, may contain lines or streaks on surface to produce weathered effect. Each marker comes with a walnut easel for a handsome display anywhere as well as a velvet style bag to store in.